So the plan for my first blog post of 2017 has changed direction somewhat. I wanted to share something with you regarding my alternative new year however the weather has been shocking here and I've been unable to take any nice pictures for the post. It will be with you eventually.... When the sun decides to show it's face and it's not so icy and cold out my hands freeze up and I can't press the shutter button on my camera. It seems like forever since I've written a review style post and although I spent most of my time between Christmas and New Year in a strange food and alcohol related coma I did manage to do a little shopping. And by a little I mean a lot; I've actually lost count of the amount of new dresses I've bought for the party season that's technically over. I've decided that Marks and Spencer is the best place to go for alternative skincare products. 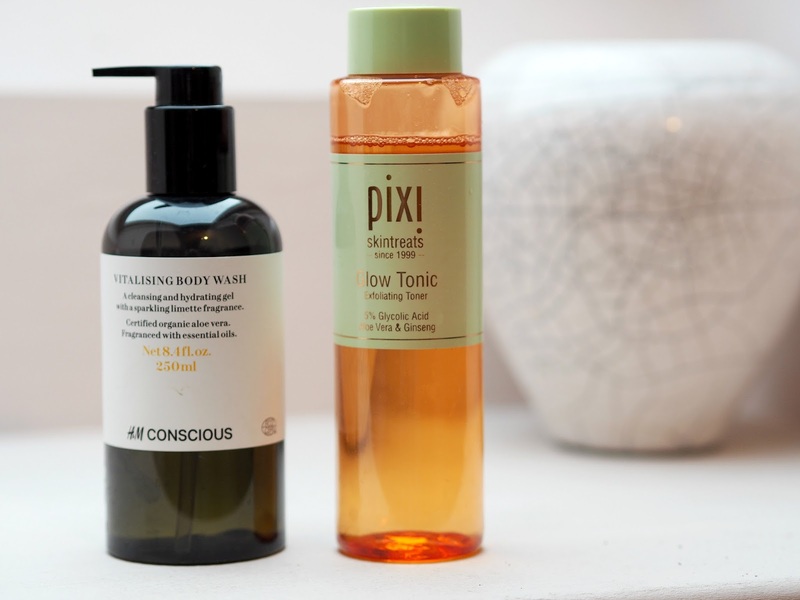 I've never really seen Pixi products in the shops, aside from at Liberty's and I've wanted to get my hands on their Glow Tonic for quite a while now. I was sceptical about trying this as I'm such a huge lover of the Bodyshop Tea Tree Toner, however this exfoliating toner is actually really lovely to use. I've noticed a definite improvement in the glowiness (is that a word?) of my skin and it does appear to do the job of getting rid of excess makeup, oil etc pretty well. I've only been using it a few weeks but I'm impressed! The H&M Conscious body wash was a gift from my best friend Sascha for my Birthday. I was 28 on 28th November (urgh OLD) and she was kind enough to get me a some lovely gifts. She's a really thoughtful gift buyer. I am a bit of a sucker for a nice smelling body wash and this one is really lovely. I'm also into the idea surrounding the range in general; H&M have marketed their Conscious range as "sustainable fashion" which is right up my street. 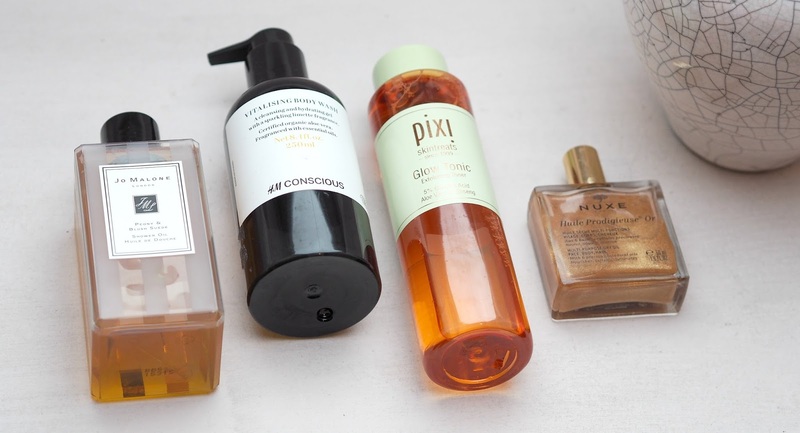 My new favourite thing for 2017 is skin oils. I already use one for my face which works a treat at reducing blemishes and gives me a great intensive moisturise. I do tend to neglect the rest of my body though and during the colder months my skin can get so dry. I fell in love with a Diptique oil that I smelt in SpaceNK a few weeks ago but when I tried to head into Brighton to purchase it the traffic was actually unbearable. 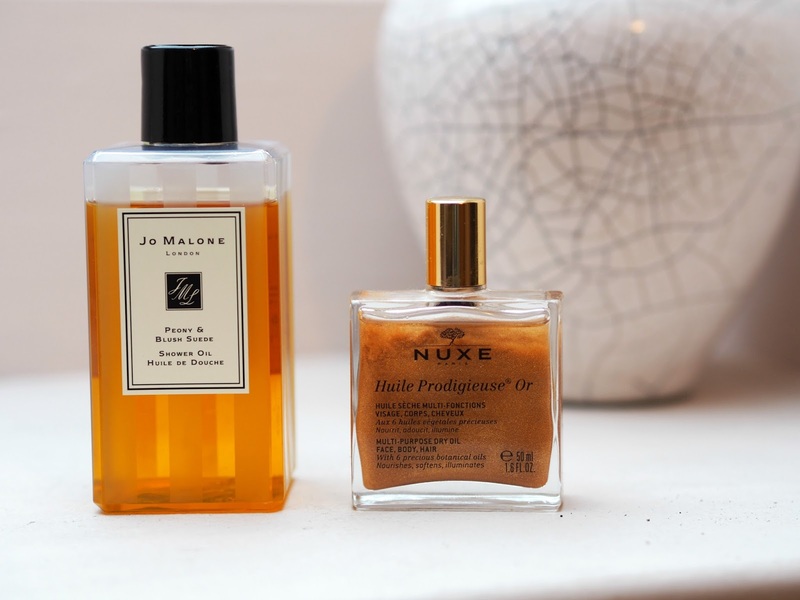 I decided to boycott town and headed to Marks and Spencer again (obviously) and saw this Nuxe skin oil which I'd heard great things about. I went with the glittery version as I like my skin to have a bit of a glow. I really enjoy using this, it works wonders on top of a good fake tan and definitely leaves your skin feeling nourished and silky smooth. The Jo Malone shower oil was a Christmas gift from my Dad, Step Mum and Sister. I already have this scent in a perfume and it's my absolute favourite so it's nice to have it as a shower oil too. Using them together just means the smell of my perfume is a lot more intense and long lasting. Don't forget to check out my Instagram for more pics and thoughts on all things fashion and beauty.